I can count on one hand how many times I’ve ventured out to Long Island. No lie, it’s out of the way for any city dweller, but I’ll tell you the reason why you need to make the trip immediately. 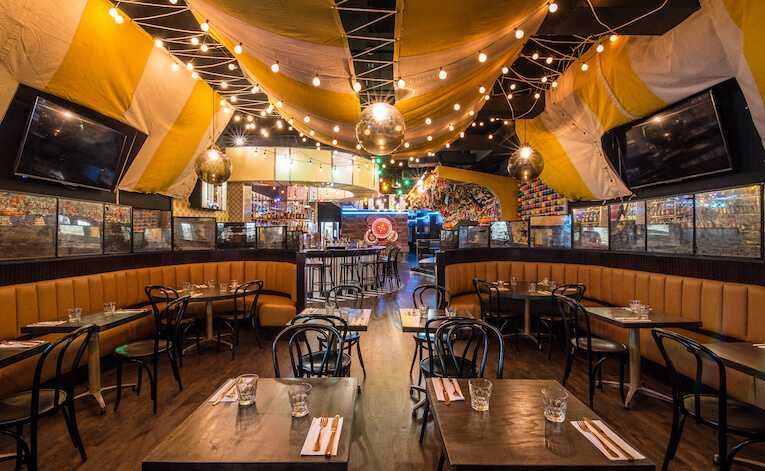 That reason is The Bowery Bar & Fare, which prides itself on — take a breath — elevated carnival eats. Yep, you’re in heaven. You made it. 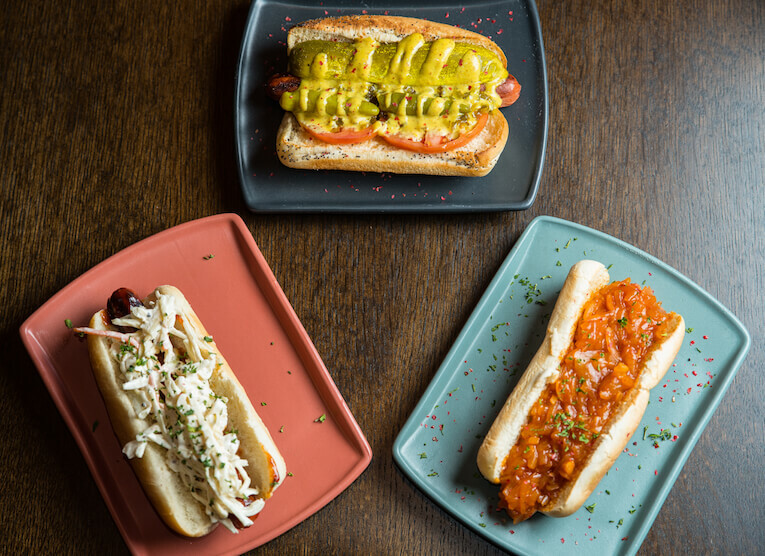 The Bowery Bar & Fare, which is located in Rockville Center not even an hour outside the city, offers an array of global street food, mostly in handheld or stick form. Imagine your favorite memory of visiting a carnival, multiply it by 100 and set off a bunch of firecrackers while you’re at it, and you have the experience this themed restaurant presents. My guest and I arrived just as the sun set, and upon walking in, we immediately knew what we were getting into. The joint was arcade- and carnival-themed with stuffed toys lining the walls and an array of lights and colors billowing from the ceiling. Simple dining tables and chairs were mutedly set against the big-bulbed drop lights. The menu is meant to be fun and nostalgic with highlights of childhood favorites. Think mini corn dogs, giant pretzels and onion rings. Oh yeah, we wanted the whole spread. 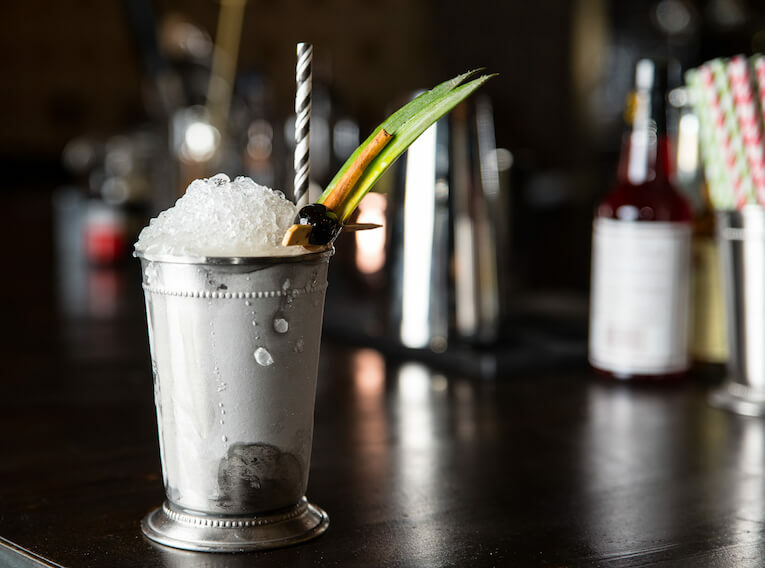 Before getting into our food decisions, we were tasked with choosing from the impressive craft cocktail menu. I went with my gut and chose the two headed man ($13), made with Cazadores tequila, pressed lime, habanero-spiced agave and a smoked paprika salt rim. My guest opted for the 40 Thives ($13), which featured Michter’s bourbon, Amaro CiaoCiaro, creme de cacao and cardamom bitters. Taking a sip of the Two Headed Man literally caused me to close my eyes and say “oh yeah” — it was that good. The cocktail had a sweet punch of spicy honey and smooth tequila nicely positioned against the savory smoked paprika rim, while my guest’s choice was sweet, dark and warm. Next up (and what you’ve been waiting for): the food. We started with the beer battered giant pretzel ($9), which was served with a cinnamon sugar cream tip and a bacon cheddar ale dip, and mini corn dogs ($8). The pretzel literally was huge and fluffy, and the dipping sauces created the perfect balance. The mini corn dogs were crispy, fluffy, stuffed with juicy hot dog and served with a seedy, bright mustard sauce. We moved onto some other bites like the salted caramel wings with bacon ($12), the rice balls ($10) and the onion rings ($6). (As you can tell, we really lived it up like it was our last, artery-clogged night on earth.) The wings were slathered in a sweet, nutty sauce and covered in fatty, salty bacon while the rice balls were creamy and meaty on the inside and crunchy and golden on the outside. The onion rings were plump and encased in golden fluffy batter. I nearly died the night I went to The Bowery Bar & Fare (thanks to my nearly-failing heart), but if I find myself needing a meal that will feed my soul, I’ll be making my way back to Long Island. Trust me guys — it’s completely worth it.